Fresnel lenses can refract light in the same way as other lenses but can be made more lightweight because of their construction. Named after their inventor, Augustin-Jean Fresnel (pronounced fray-NELL), they were originally developed for lighthouses. Nowadays, they are commonly used for vehicle headlights, traffic lights and other lighting. The normal convcave or convex lens interrupts the normal flow of the light, causing it to bend inwards or outwards. The focal point is where the rays come together and can be the source of the light or can be where the light comes together. If you needed a lens where the aperture was large but the focal length was short you would need a huge, heavy one! 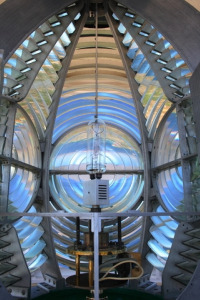 The Fresnel lens is stepped so that the light is still refracted but with much less lens. This makes it cheaper, lighter and more practical. 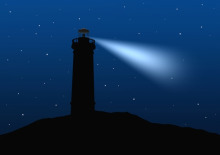 In a lighthouse, the light source is close to the lens. The lens bends the light outwards so that it can be seen at a distance. Conversely, the light source could be far away and require to be focused at a single point. For example, we've all seen what happens when the Sun shines on to a magnifying glass - the light can be focused on a single point which in turn generates heat. Imagine how powerful this would be with a huge lens? A huge lens would be impractical, but a Fresnel lens could be smaller and achieve the same effect. In fact, these lenses have been known to generate enough heat to boil water within seconds. How can I buy a Fresnel Lens? Modern lenses are manufactures from a variety of glass and plastics. We can supply borosilicate glass Fresnel lenses. Borosilicate glass is heat resistant so the lenses are ideal for anything hot, such as for stage lighting.